Alteration of mechanisms monitoring cell cycle progression leads to cancer whereby cell proliferation is not integrated with control signals. Instead cancer cells tend to proliferate in an uncontrolled fashion and become insensitive to external stimuli and checkpoint signals that ensure correct execution of the cell cycle. The unfaithful progression trough the cell cycle leads to genome instability, a feature of cancer cells. Genome instability is a hallmark of cancer and is exploited to treat multiple cancer types through the use of chemo- and radio- therapy. The ubiquitin system (Figure1A) lies at the heart of the cell cycle control and checkpoint mechanisms. The system dictates the fate of cellular proteins by tagging specific proteins with the small molecule ubiquitin. Single ubiquitin molecules are added via an enzymatic cascade, in which ubiquitin is activated by a covalent linkage to an E1 ubiquitin activating enzyme and transferred to an E2 ubiquitin conjugating enzyme. The E3 ubiquitin ligases mediate the covalent linkage of ubiquitin to a lysine residue in target substrates to form polyubiquitin chains of different type. The ubiquitin chains formed can serve as a recognition signal for degradation by the proteasome or as a platform of interaction to proteins containing ubiquitin interaction domains. The human genome codes for two E1s, 35 E2s and more than 700 E3 ubiquitin ligases. Although E3s have crucial functions in genome stability and are amenable to chemical inhibition and activation, the function and mechanism of action of the majority of E3s remains unknown. 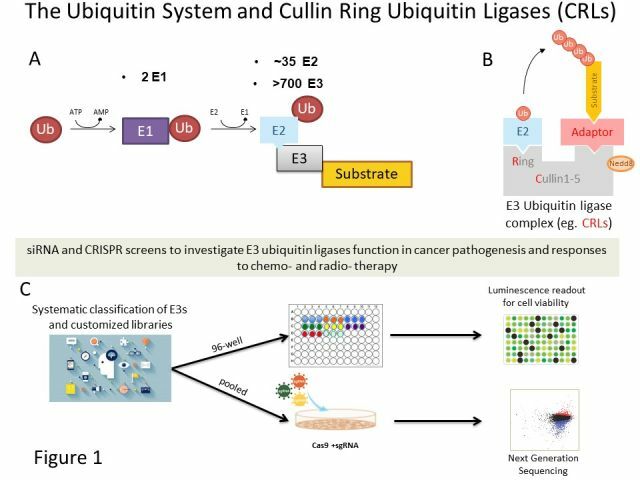 The laboratory is investigating the role and mechanism of action of a subset of E3 ubiquitin ligases named Cullin Ring ubiquitin Ligases (CRLs). CRLs share a similar organization where a central scaffold (cullins) bridges the interaction between, a ring finger containing protein and an adaptor for substrate recruitment (Figure 1B). The laboratory is querying the functional role of E3 ubiquitin ligases, running a combination of siRNA and pooled CRISPR screens, using customised siRNA and sgRNA libraries (Figure 1C). A prototypical CRL complex is formed by cyclin F (Fbxo1), which uses an F-box domain to recruit Skp1. I previously discovered that the E3 ubiquitin ligase cyclin F controls the levels of Ribonucleotide Reductase, an essential enzyme for the production of deoxyribonucleotides (dNTPs), the building blocks of DNA. 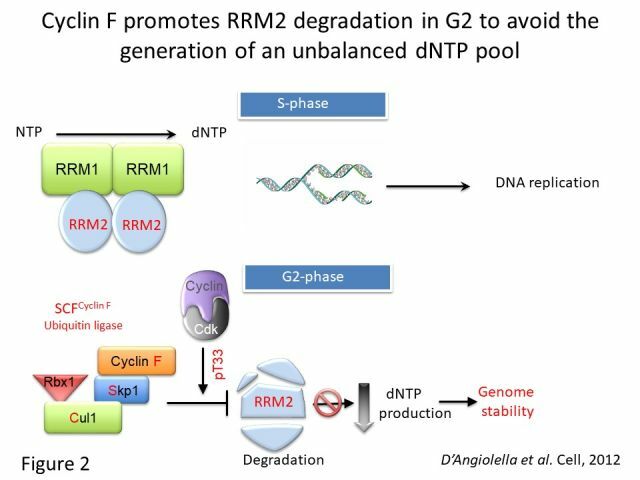 This mechanism ensures supply of dNTPs during normal cell cycle progression and after genotoxic stress (Figure 2). Alteration of coordination between nucleotide production and cell cycle progression underlies genome instability in the early stages of cancer transformation. Therefore, it is crucial to identify how the coordination between dNTP production and cell cycle progression ensues. In addition to the aforementioned studies, my laboratory has extended the studies from cyclin F to identify the function of E3 ligases in brain cancer pathogenesis. We have identified the function of FBXL17. The study demonstrated that FBXL17 can act as a bona fide oncogene in medulloblastoma, where it targets for degradation a well-known tumour suppressor called SuFu. Furthermore, we have identified a novel role for FBXL13 in controlling migration of cancer cells. We believe that the study of the ubiquitin system will unveil novel strategies for the management of cancer in combination with ionising radiation therapy. SCF (Fbxl17) ubiquitylation of Sufu regulates Hedgehog signaling and medulloblastoma development. FBXL13 directs the proteolysis of CEP192 to regulate centrosome homeostasis and cell migration. SnapShot: F Box Proteins II.